B) a fine, upstanding businessperson earning a living by providing credit to those who need it the most? A) Good for the government? B) How dare the government interfere with something already regulated by states? These questions are extreme and provocative, as is the subject, which in another month or so will be pertinent as the federal Consumer Financial Protection Bureau releases proposed rules to put the brakes on the payday lending industry. Some in Congress, including a top national Democrat and two Ohio Republicans, are fighting back, supporting the industry's position. A payday loan is a loan taken out for a short period, usually to provide cash to help someone pay bills or expenses until his or her next paycheck. It requires the borrower to have two things: a bank account and a job. Notice what's missing: proof of the ability to repay. In some situations, the borrower writes out a check for repayment and interest, but the lender promises not to cash it until the borrower's payday. In an ideal world, no. 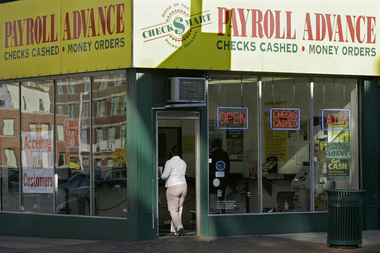 Borrowers go to payday lenders when they have no other choice, and this helps them keep the lights on or the kids fed. Payday lending is a source of regular commerce in low-income neighborhoods. But there's a flip side. The loans require a borrower to have a job, yet aren't based on his or her ability to repay. The typical payday loan of $375 is for a two-week period and has $55 in fees. Paying it back would eat up 36 percent of the typical borrower's gross pay, says Nick Bourke, director of the Pew Charitable Trusts' small-dollar loans project. So on payday, the borrower pays it back right away -- and then, to eat and keep the lights on the next week, takes out a new loan. The new loan is for the same amount, and has another $55 in fees. This repeats itself in a regular cycle. The vast majority of people who take these loans "are multiple-transaction borrowers," says David Rothstein, director of resource development and public affairs for Neighborhood Housing Services of Greater Cleveland. But isn't the basic interest rate low -- even less than credit cards? The payday loan industry and defenders present it just that way. Do the math for that original $375 loan and the fee comes to a straight 15 percent, with no compounding, unlike, say, a mortgage or credit card that compounds annually. But in practice, critics say, the cycle of borrowing, repaying and then re-borrowing -- with fee after fee -- is little different from consumer loans where the interest rate is accounted for on an annual basis. And on this basis, the typical annual percentage rate, or APR, for a payday loan comes to 391 percent, Pew says. Pew looked at data for a number of states, including Ohio, and said that over five months in Ohio, a $300 payday loan would cost a borrower $680 in interest because of this cycle, representing an average APR of 591 percent. Are there state laws on this? There are. Ohio passed one in 2008, capping the annual percentage rate at 28 percent and limiting borrowers to four payday loans a year, with a loan cap of $500. So payday lenders started working under other sets of laws to get around the limits, says Rothstein. The Ohio Supreme Court upheld their right to do so. The loans are available; just don't call them "payday" anymore. Some are auto title loans, where the lender takes the title to a car as collateral. Others are given under laws designed for small loans of $5,000 to $10,000, or for second mortgages, or through so-called credit service organizations. As a result, the loans in Ohio "are getting bigger and longer," Rothstein said in a presentation at Pew this week. "We have watched in Ohio as the $300 loan for $345 has morphed into a $2,000 loan paying back a total of $5,197." Is any state considered better? Colorado is admired by the payday loan industry's critics because the state replaced two-week, lump sum payday loans with six-month installment loans -- with interest rates almost two-thirds lower. According to Pew, half of Colorado's payday loan stores closed after the 2010 law took effect, but the other half now serve twice as many customers at each location. Average borrowers there pay 4 percent of their next paycheck toward the loan, instead of 38 percent. That $680 in interest that an Ohioan would pay on a $300 loan over five months would cost a Coloradoan $172. What does the Consumer Financial Protection Bureau want to do? Based on preliminary guidelines it published last year, the bureau could require that short-term payday loans -- 45 days or fewer -- be limited to no more than $500, with limits on how often a borrower could take out or refinance such a loan. Longer-term loans could require the lender to get proof of the borrower's ability to repay, including income verification. One proposal could cap long-term interest at 28 percent APR, or limit loans so payments come to no more than 5 percent of a borrower's take-home pay. Whose definition do you want? Advocates for the working poor say the rules are a start but could be stronger. But two dozen members of Congress say the rules are unnecessary, and are pushing a bill to delay them from taking effect. Rep. Debbie Wasserman Schultz, a Florida congresswoman who chairs the Democratic National Committee, is among the co-sponsors of the bill that would stall the rules. So are Ohio Republican Reps. Steve Chabot and Brad Wenstrup, both from the Cincinnati area. Most of the bill's backers are from Florida and say Florida's rules on payday lending are strong. Their bill would block CFPB rules on payday lending for two years, and then only affect states that did not implement their own rules along the lines of Florida's. Asked about complaints that current payday loans are predatory, Wesnstrup spokewoman Meghan Waters said, "There can be problems with the industry, as with any industry, but the CFPB's proposals are more burdensome than is necessary." She said the proposed rules would restrict consumer access to credit. Wasserman Schultz's office did not reply to a request, given directly to a spokesman, for comment. The issue has dogged Wasserman Schultz in her House reelection bid. Does Wasserman Schultz have a point -- that Florida provides a good model? The typical Florida payday loan has a 300-percent APR, the groups said in a letter to members of Congress. The law allows lenders to wreak "havoc on households who are already struggling financially," and permits interest rates that once were illegal in all states, the groups said. Florida also allows back-to-back lending without considering borrowers' ability to repay, the critics say. The payday loan industry says states have regulation covered, so more regulation is unnecessary. The Consumer Financial Services Association of America, the voice of the industry, says consumer complaints about payday loans are low. "Many Americans live paycheck to paycheck and rely on short-term credit during financial emergencies," Dennis Shaul, the association's chief executive, wrote in The American Banker in February. "Many of these households turn to short-term credit when they are met with unexpected expenses, such as medical emergencies or car repairs, and have nowhere else to turn." The CFPB says it will release proposed rules this spring. Those watching say May or early June are likely.